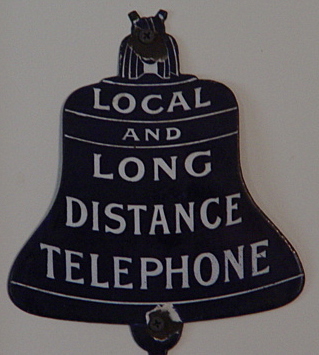 This is a very old and unusual Independent Telephone sign. The hand is pointing to a "Pay Station" where "Long Distance" calls could be made. This sign dates back to around the 1880's and was probably used at a central office location. 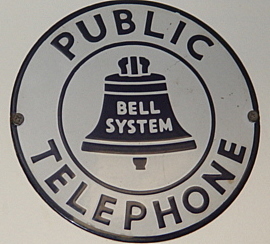 11x11" Public Telephone Connections sign used by independent Telco's showing that they were connected to the Bell System. Sign has the 1939 Bell on it. This sign has been in my collection since almost the beginning. 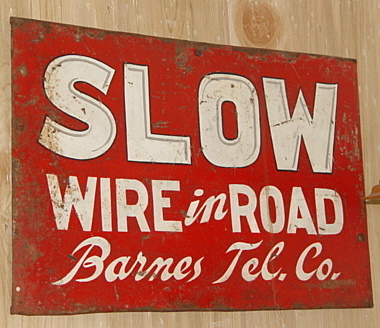 It's a painted on tin sign that comes from around Barnes, Kansas, letting the public know of the danger ahead with wire being in the roadway. Unusual Independent sign with a swatch across the red, white and blue shield. The flange has be cut off but it's still a nice sign. 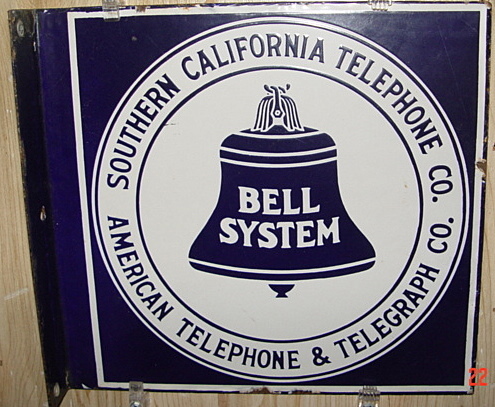 Early Southwestern Telegraph and Telephone Co. Pay Station sign with early 08 Bell on it. Notice how the hanger is horse shoe shaped and not the traditional twisted rope style on other earlier signs, also this sign is 2 signs bolted back to back to make one sign. This Co. is one of two companies that formed Southwestern Bell Tel. Co. The sign was probably used in either Texas, Okla. or Ark. 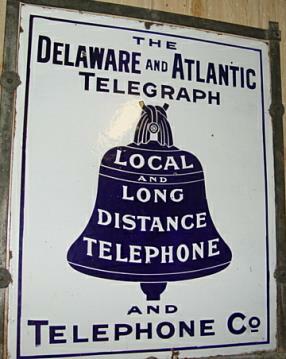 Tri-State Telephone and Telegraph Co. strip sign with Long Distance Service shield. 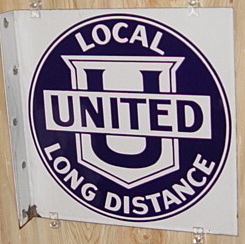 The 2 3/4 x 28 1/2" sign, was used around the upper Midwest. 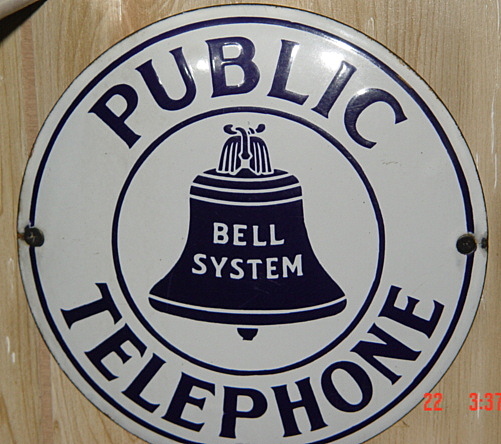 Public Telephone Hubcap with 1921 Bell. 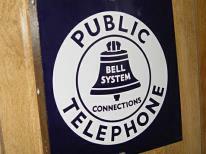 This sign was used in and around bus and train depots to let the public know where they could find a Public Pay Phone to make calls. 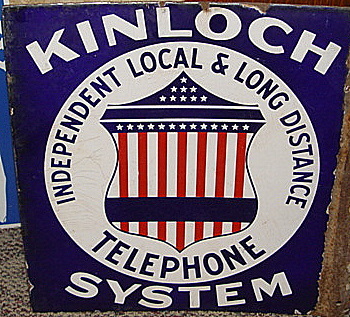 Kinloch Telephone system was an Independent Co. in the St. Louis, Mo. area. The sign measures 17x18". 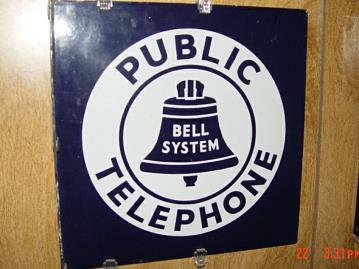 The Citizens Telephone Co. Inc. Hard to find 11x11" sign, with the 21 Bell. This is an Ohio company. 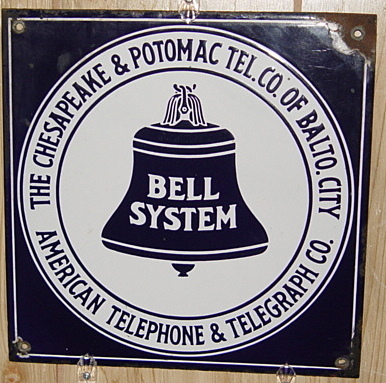 Chesapeake and Potomac Tel. Co. of Balto. City 11x11", comes from the Baltimore, MD. area. C&P was one of the many Companies owned by AT&T. Commonwealth Telephone Company 11x11" sign. They were a General Tel. Sys. Co. I liked the graphics of the pole in the middle of the sign. 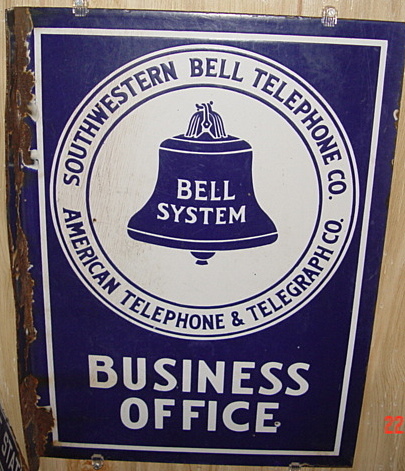 Southwestern Bell Telephone Business office sign, with 21 Bell. This sign measures 22x16" and is flanged. 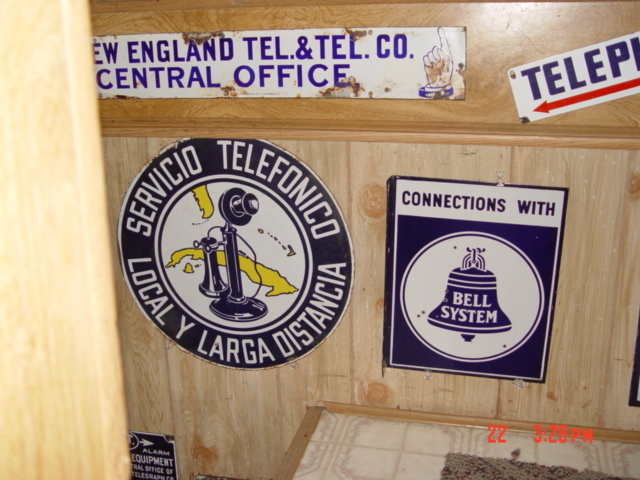 Southwestern Bell Telephone Co. 11x11" sign with the 21 Bell was also an AT&T Co.
United Local and Long Distance 11x11"
The Cuba sign is colorful and has a picture of a candlestick phone in the middle of it. Signs that depict a phone in it are hard to find and are sought after by most collectors. The New England Central Office sign with the pointing hand is also hard to find and desirable. 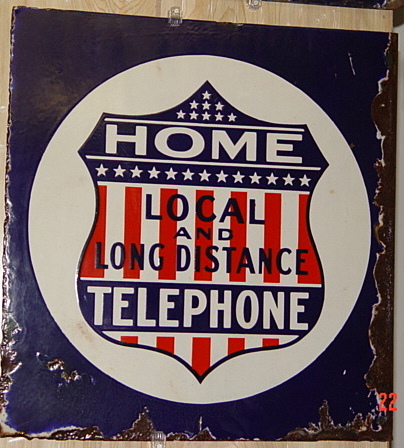 Home Telephone Co. Local and Long Distance 17x18" sign. Home Tel. Co. was in different parts of the U.S. This particular sign was found in Kansas. Southern New England Tel. 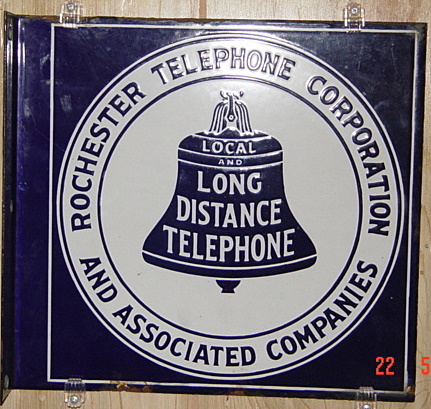 Co. 11x11" with 21 Bell was another AT&T Co.
Rochester Telephone Corp. 11x11" sign, has the 08 Bell. This Co. was in Rochester, NY. 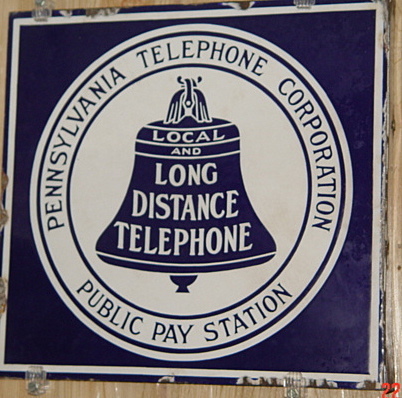 Pennsylvania Telephone Corp. Public Pay Station 11x11" sign with the 08 Bell. 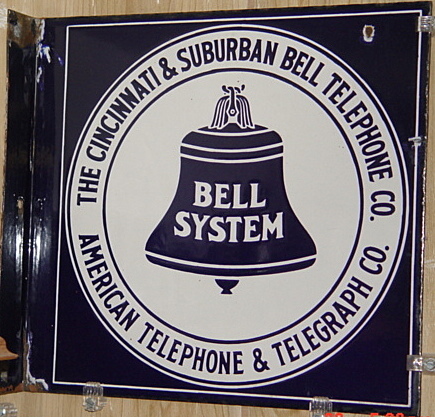 Cincinnati & Suburban Bell Tel. Co. 11x11" sign with 21 Bell also an AT&T Co. Located in Cincinnati, Ohio. 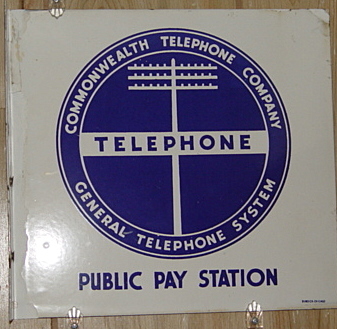 Telephone Pay Station 5 1/2 x 19" was used in the Independent Tel. Co.'s area to let the general public know where Pay Stations were located. 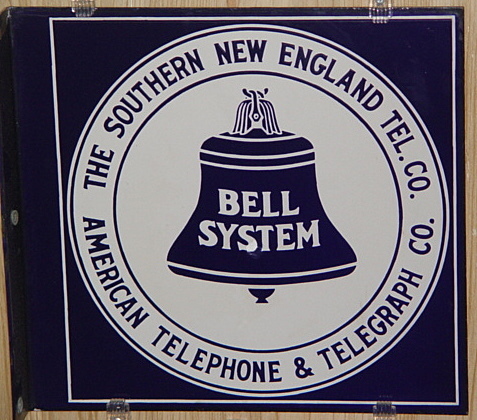 New England Telephone & Telegraph with 08 Bell usually hung on a bracket outside of Telephone Co. Offices. 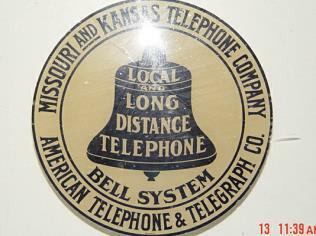 Missouri and Kansas Telephone Co. decal with 08 Bell on a glass pane. Missouri and Kansas is the other Tel. Co. that formed Southwestern Bell Telephone Co. 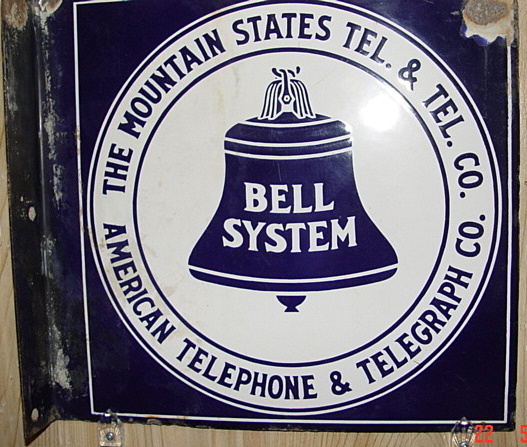 The Mountain States Tel. & Tel. Co. 11x11" sign with the 21 Bell. Another AT&T Co. 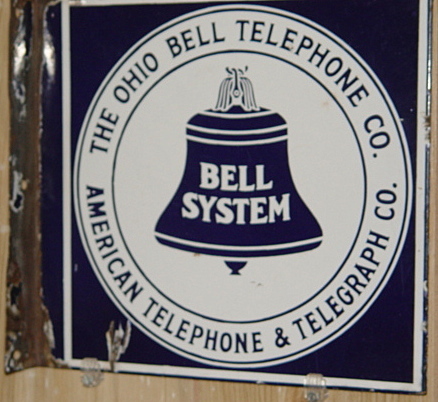 The Ohio Bell Telephone Co. 11x11" sign with the 21 Bell. Yet another AT&T Co. 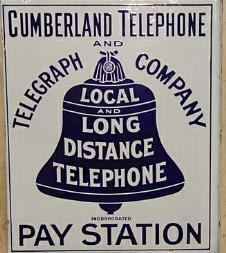 Here is a neat, neat Cumberland Tel. & Tel. sign. This sign was never placed in service. The porcelain is still around the grommet holes and they have never seen a screw or bolt. This is an old Western Electric System sign. It measures 16x 20 and has a logo that I have never seen before. 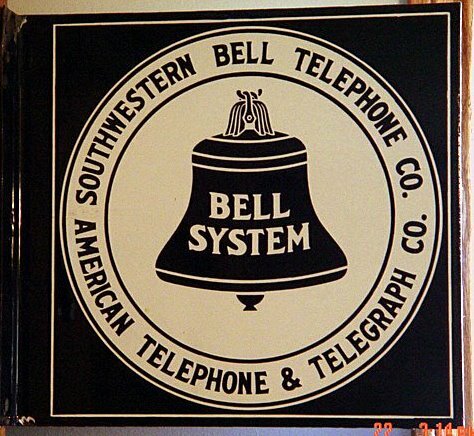 After doing some research on this sign, I think it was a company not associated with the Bell System's, "Western Electric", but a stand alone co. in Western Iowa and Eastern Dakota's. Since the sign does says "Long Distance" and not Local and Long Distance I think it's from the 1880's. Hard to find 6" Hubcap Conestoga Tel. and Tel. Co. Sign from Birdsboro, Pa.
Another 11x11" C&P sign except this one is from West Virginia. Denver and Ephrata 8" HubCap sign. The company was located in Pennsylvania and not Colorado as one might think. This is a hard to find 8" Hubcap from the Chesapeake and Potomac Tel. Co. of Baltimore, MD. 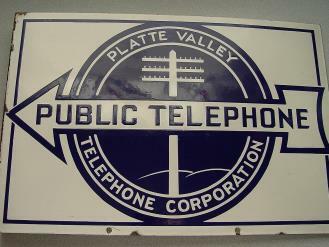 Here is a Platte Valley Telephone Corporation 17 1/2 x 12 " sign. This sign is from the Platte Valley area in Western Nebraska. Here's a United Telephone and Telegraph Company 18 x 18" sign with clasping hands. This is a hard sign to find. Here's a Chicago Telephone Company an American Telephone and Telegraph Company 15 x 17 1/2", double sided flanged sign, with the "09 Bell". This is a harder sign to find with the white background. 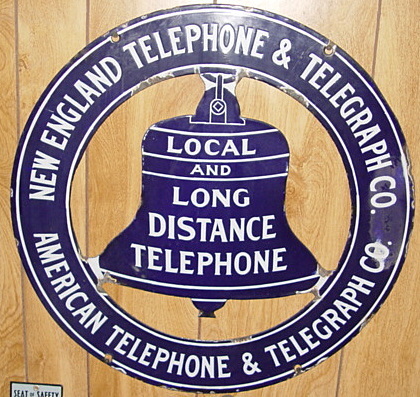 Here's a New England Telephone & Telegraph Co. 23 x 17 1/2" double sided flanged sign, with the "09 Bell". Notice the way they made the C on both Licensee and Co. This is an old sign. I found this sign while on vacation in Maryland. It's an etched glass sign with Public Station instead of Pay Station etched into the glass. It does have the "08" Bell.